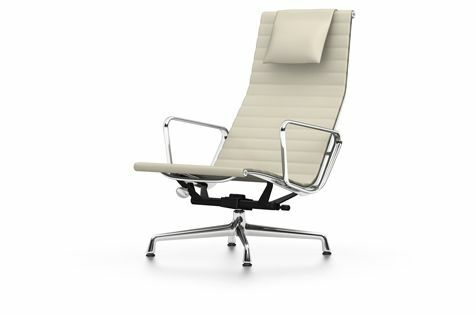 The Aluminium Chair EA 124 is the quintessential lounge model in the Aluminium Group by Charles and Ray Eames. The chairs extraordinary comfort results from the extra-high backrest and head cushion in combination with the tilt mechanism, which can be adjusted to the users weight. The swivel chair EA 124 can be paired with the stool EA 125, forming the perfect spot to put your feet up and enjoy a long, cosy evening with a good book. Chair with high backrest. High-frequency welded upholstery with horizontal ribbing; cover in Hopsak, Leather or Premium Leather. Side profiles and spreaders in polished or chrome-plated die-cast aluminium.